What are Small to Medium Dog Crates and Cages? You already know what dog crates are. They are great and humane ways to keep your dogs feeling safe and protected while you’re away, asleep, or otherwise engaged and can’t exactly look out for them at the time. Aside from that, dog crates are essential accessories for any dog parent because of the natural den instincts of dogs in general. Dogs are den animals and love a place where they can feel secure and safe in times of stress or depression. So when you decide to get your dog a crate, you’re not being inhumane, you’re actually helping your dog and yourself. Because dogs come in different sizes, dog crates naturally have to come in different sizes as well. So, there are different sized crates tailor-made to suit different dogs, from large, to medium, to small, to extra small. Today, however, our guide zeroes down to small and medium dog crates alone. Today, we are going to give you all the details on small and medium dog crates, so don’t stop reading this article, and at the end, you’ll be well-versed on all things crate (at least the small and medium ones). If you want to get a crate that’s perfectly suited to your dog, then, of course, you must measure your dog. Bear in mind that you don’t want to get your dog a crate that’s too spacious or something that’s too constricting. He needs enough space in order not to get cramped but he also needs to feel secure, hence it mustn’t be too spacious. Now, here are the steps to measuring your dog for his crate. Small and medium dog crates can be made from a variety of materials and each type is best suited for a particular type of dog. Briefly, let’s examine each type and see their pros and cons. 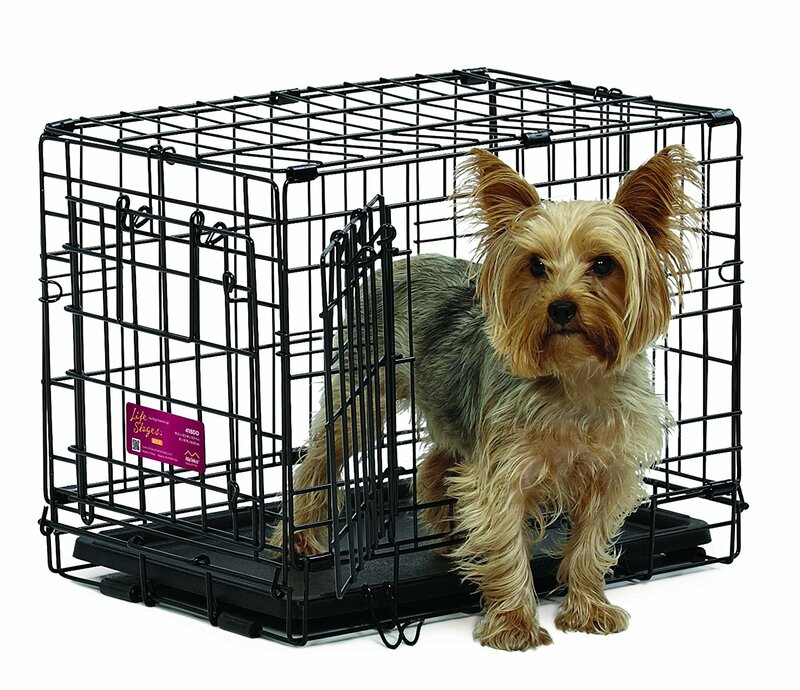 Wire Dog Crate: These are the chief reasons most people love wire crates, and the reasons they are particularly advantageous: visibility and adequate ventilation. It’s a great option especially if your pup isn’t an escape artist, and many of them come collapsible for easy storage and transport. In all honesty, they are about the least attractive options and tend to be a bit noisy when compared to other types. But then, they clean out easily and come with divider panels to help accommodate your dog as he grows. Plastic Dog Crate: Just like wire crates, plastic crates aren’t super attractive but if your pet is a hermit and loves to be secluded so he can catch a wink, then you will be doing him a favor by getting him a plastic crate. Problem is that they aren’t so adequately ventilated and cleaning them out can be a chore. If your dog is an escape artist though, don’t worry because plastic dog crates are a worthy match. They are fantastic options for air travel and when not in use, they store pretty easily. Soft-Sided Dog Crate: The soft-sided dog crates are great on several counts. They store very easily; they’re portable because of their light weight and are great for road trips. Of course, we will not try the abomination of failing to mention that soft-sided dog crates are dang fashionable! You’ll definitely get one that suits your tastes per time. They are, by far, the most attractive of the crate options. Heavy-Duty Dog Crate: If your dogs are naturally clever or with destructive tendencies, the best type of crate to get them is a heavy-duty crate. Although expensive, the costs are quite bearable since they can withstand a lot of abuse from your pup. Also, most of these crates are approved for flying, so you might not have to purchase a new one for that purpose. What dog breed for what crate size? Extra Small Dog Crates: These are usually about 18 to 22 inches in length. They are best for small dogs weighing less than 25 pounds with a measurement of 20 inches in length and 14 inches in height while sitting. Dog breeds that will most likely need an extra small dog crate include Yorkshire Terrier, Affenpinscher, Maltese, Papillon, Toy Fox Terrier, Bichon Frise, Chihuahua, Pomeranian, Shih Tzu, Boston Terrier, Brussels Griffon, and a Pug. Dimensions for extra small crates include: 18 x 12 x 14 inches; 22 x 13 x 16 inches; 19 x 12 x 15 inches. Small Dog Crates: These come as 22 to 24 inches in length and are best for dogs weighing up to 30 pounds or less. Also, ideal dog measurements for a small dog crate are 22 inches in length and 19 inches in height while sitting. Dog breeds best for small dog crates include Affenpinscher, West Highland White Terrier, Australian Terrier, Miniature Dachshund, Norfolk Terrier, Toy Poodle, Border Terrier, Cairn Terrier, Jack Russel, Pekingese, Skye Terrier, Fox Terrier, Havanese, and Scottish Terrier. 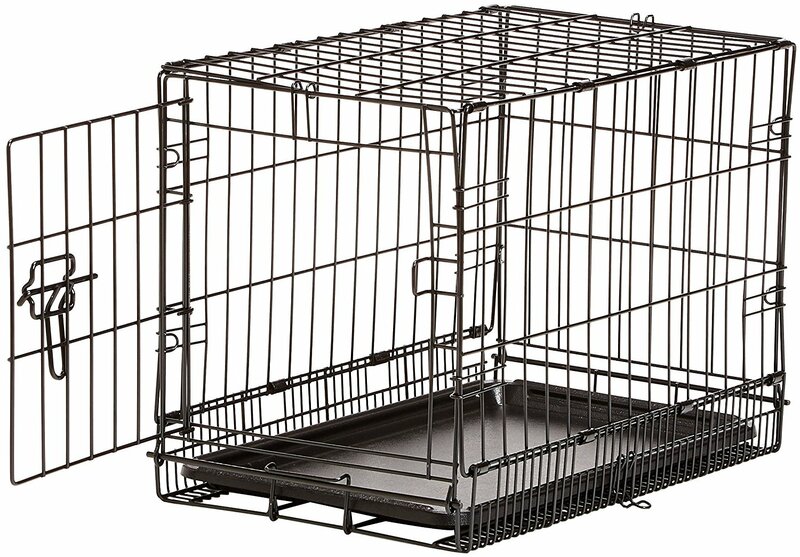 Popular dimensions for small dog crates include: 24 x 18 x 21 inches; 24 x 18 x 19 inches; 24 x 17 x 20 inches. Medium Dog Crates: These are also known as 30inch dog crates. They usually come in a length of about 28 to 30 inches and are best suited for dogs weighing 40 pounds or less. A dog that will require a medium dog crate should also measure about 28 inches in length and 23 inches in height while sitting. Medium dog crates will best cater to the following dog breeds: Lhasa Apso, West Highland Terrier, King Charles Spaniel, Miniature Pinscher, Welsh Terrier, American Pit Bull Terrier, Keeshind, Miniature Schnauzer, Welsh Springer Spaniel, American Staffordshire Terrier, French Bulldog, Shetland Sheepdog, Tibetan Terrier, Basenji, Dachshund, Cocker Spaniel. Dimensions for medium so crates include: 30 x 19 x 21 inches; 30 x 21 x 24 inches; 30 x 19 x 22 inches. Now that we’ve given you an overview of things you need to know while shopping for small to medium dog crates and cages, let’s now take you into individual product reviews so you can pick the one that’s best for your pup. Amazon Basics, a subsidiary of the well-known and world’s number one online retail platform, Amazon, is an exceptional brand. Since its inception, it has delivered to its customer’s world over amazing customer service by delivering to them only the best products at the most unbeatable prices. Manufactured in China and Taiwan, products from Amazon Basics are made to be absolutely user-friendly, high quality, and intelligent. 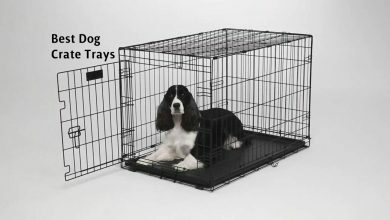 We welcome at our number one spot the very sturdy puppy cage from AmazonBasics, the AmazonBasics Folding Metal Dog Crate. This is the crate to go for when you need something tough for your pup. There are two options for this particular product: it comes with the single-door option and the double-door option, depending on which you or your pup favors. For maximum security, the door(s) come with two slide-bolt door latches. Now, you can sleep with your two eyes closed knowing that however restless your dog gets, he will still be safe and secure in his wonderful new crate. If you’ve got a pup that tends to get excited and jumpy very easily and can’t ever seem to calm down, then it would matter to you how sturdy a dog crate is before you buy it. Thankfully, this crate is rock solid with its metal construction. And even at that, it comes easily foldable making transport and storage super easy. By foldable, we actually mean that this crate folds flat! Also, let’s not forget other automatic advantages that come with a metal cage: easy visibility, and adequate ventilation. We know how dogs can get when they get playful. Many times with a metal dog cage, they might stick their paws in between the gaps and then freak out. Taking the initiative, the manufacturers have closed up the gaps at the bottom perimeter with mini dividers. Now your dog’s paws can stay where they ought to be: in the cage. 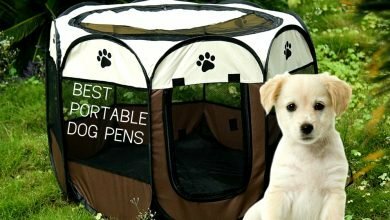 It even comes with a divider panel, if you need the unit a little cozier for your small puppy; as well as a plastic pan too. Do you need a medium size dog crate exactly like this one from AmazonBasics? They’ve got it too! Other features: Ideal sized cage for puppies and small breeds; attractive pink color; secure lock system; all-steel construction for strength and durability; folds easily for transport and storage; comes with a removable, washable pan. It might interest you to know that Carlson is solely responsible for providing you with the pet gates that you’re so relieved about. In the very words of the brand, “Carlson pet Products started when we realized pet gates didn’t exist”. Pet people themselves, the team over at Carlson ensures that all its products, from pet gates to dog crates, are manufactured with regard to safety, health, and protection of our darling pets. Awwwnnnn… this dog crate is so darling! 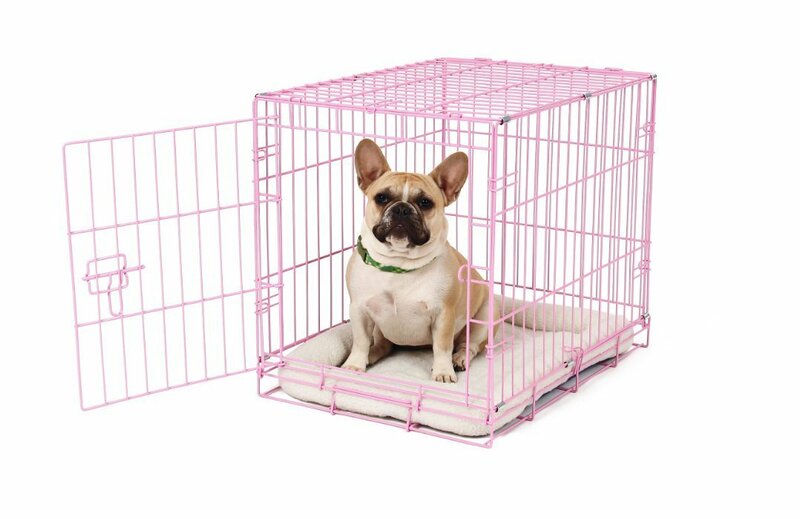 The Carlson Pink Secure and Compact Single Door Metal Dog Crate is a cute, lady-like small dog crate that’s fit for a princess. It will be love at first sight between your dog and this thing, we tell you. Don’t be fooled by the fact that it’s pink or that it’s called a small dog cage, this crate has a mean tenacity to it. It’s constructed of steel which gives it strength and automatically confers durability. Even when your puppy grows out of it and becomes a mother, her pups can use the same crate she used too. Now wouldn’t that be something? To ensure the security of your princess because, well, you love her; this cage comes with a secure lock system on its single door. So whether it’s a road trip or just sleep time at night, you can be confident that you’re doing your job as a dog parent with your pet completely safe and secure. “Accidents” happen if you know what we mean, and that’s why the manufacturers have graciously thrown in a plastic pan as well. It’s pink, removable, and washable. This way, you can maintain the hygiene of the crate, your home, as well as the health of your dog too. 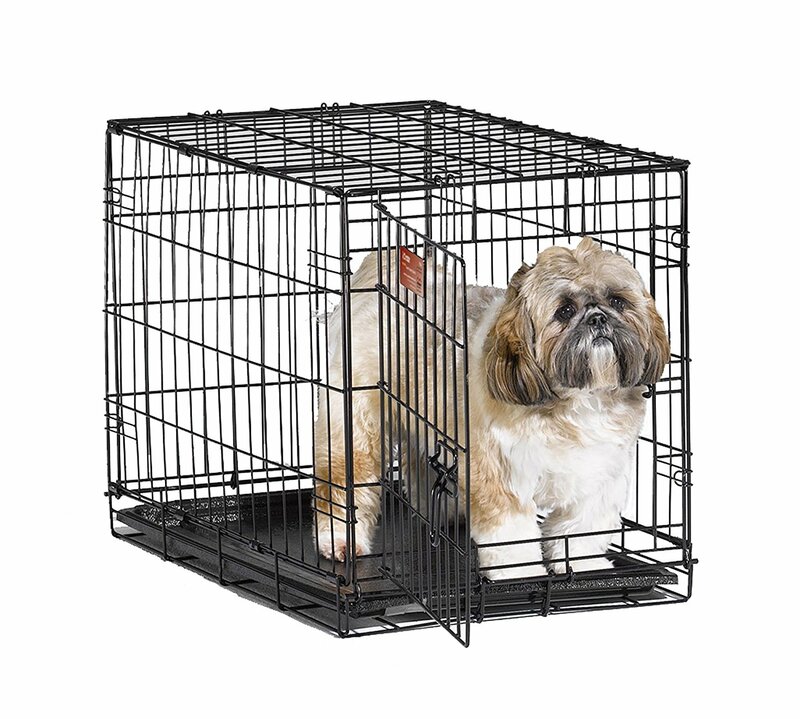 Caveat: this is not a medium dog cage; the manufacturers have clearly stated that this is a crate for a puppy or a small breed. It’s best for dogs weighing 25 pounds at the most. PS: You might want to get this crate for your female pooch. We don’t think the dudes will be too excited about living in a pink crate. You know they have a macho reputation to protect. Lol. Internet’s Best is one of the best places to get quality kitchenware and household items that fit your lifestyle perfectly. With an eye for beauty, this brand defines “great products” as products that are functional as well as eye-catching. Internet’s Best effortlessly proves to you that you can have the two. The customer service offered by this company is simply first-class and you’d hardly find a better service elsewhere. We love the Internet’s Best Double Door Wire Dog Kennel for so many reasons. And we’re pretty sure that you and your dog will soon catch the love bug for this thing pretty soon too. So, without further ado, let’s go down to what this crate can do. First off, this particular size is a small dog cage, (there are options for a medium dog crate as well) so it’s best for your puppies and other breeds that are small in size. Do NOT try using this for an aggressive dog like a bulldog or a pit bull. For easy and convenient access, you will find that this cage comes with a front door and a side door. So whether you’re trying to clean out the cage or you’re trying to bring in food or bedding, it’s not super constricted and you can get the job done neatly. Talking about cleaning, there’s a removable pan with this cage and it’s washable too. So when they make a mess as they will always do, you can easily take it out and wash it off. If your pet is one with scratchy paws and just won’t keep his paws to himself, then don’t worry. This crate is made of tough wire steel. No matter how much he scratches, the crate won’t crack. Of course, as long as it’s not an aggressive breed like the dogs we mentioned earlier. Collapsing and folding easily, you won’t have any problems moving this around or storing it either. It even comes with a carrying handle to make things more convenient. MidWest Metal Products is one of the finest metal benders in the industry of wire and sheet-metal fabrication. Its commitment to consistent research into consumer wants led the company to start a new product line dedicated to pets. These products are grouped and carried under the brand name MidWest Homes for Pets. With its line of pet products and accessories constantly increasing, this brand is meeting more pet demands than ever. And in a few years, it would have spent a century exceeding customers’ expectations. 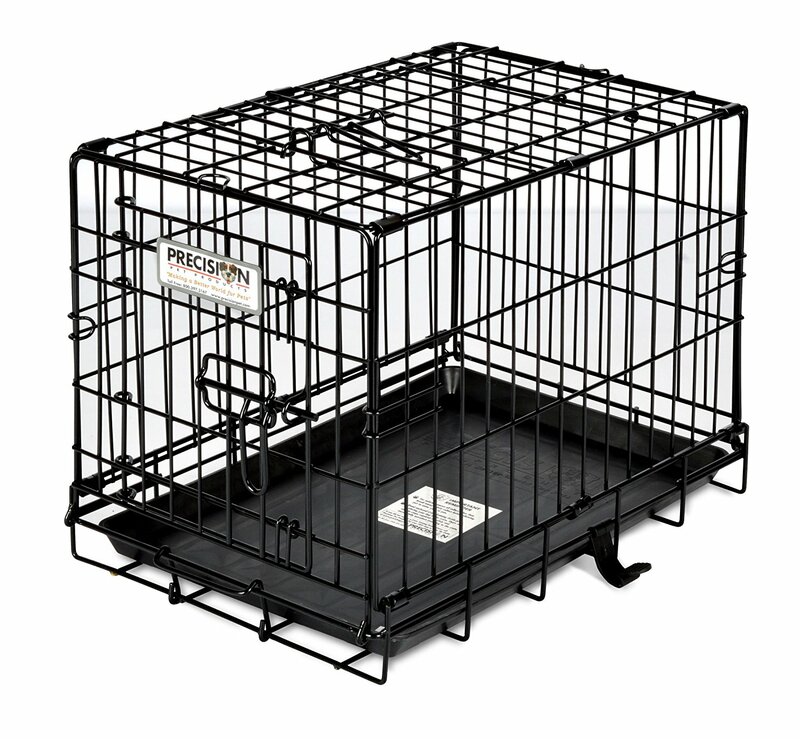 The fantastic puppy cage at our number four spot is the MidWest iCrate Folding Metal Dog Crate. It’s an excellent choice if you’re looking for a cute dog crate for your small dog such as your Toy dog. 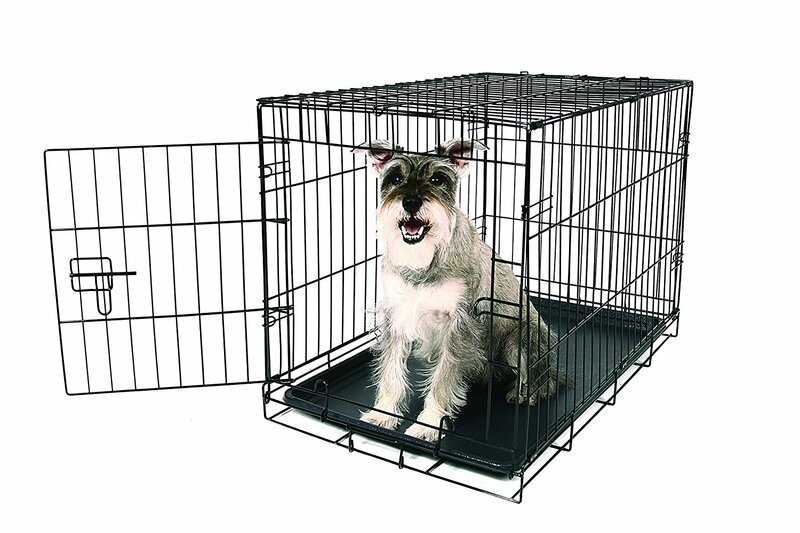 Now in the case where this cage is a tad too large even for your small pup, then you can reduce living space by using the free divider panel included in this unit. 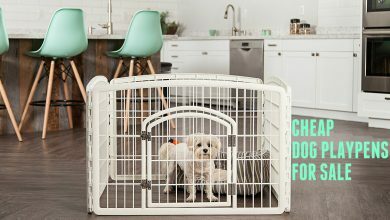 This way, you save money by using the same crate as your dog grows and at the same time raising your dog the way he should. And if your question is “will it last that long?” then allow us to debrief you about the construction of this cage. It comes with an all-metal construction, making this cage strong enough to withstand any form of abuse. So you can be sure that this cage will last because it was built to last. 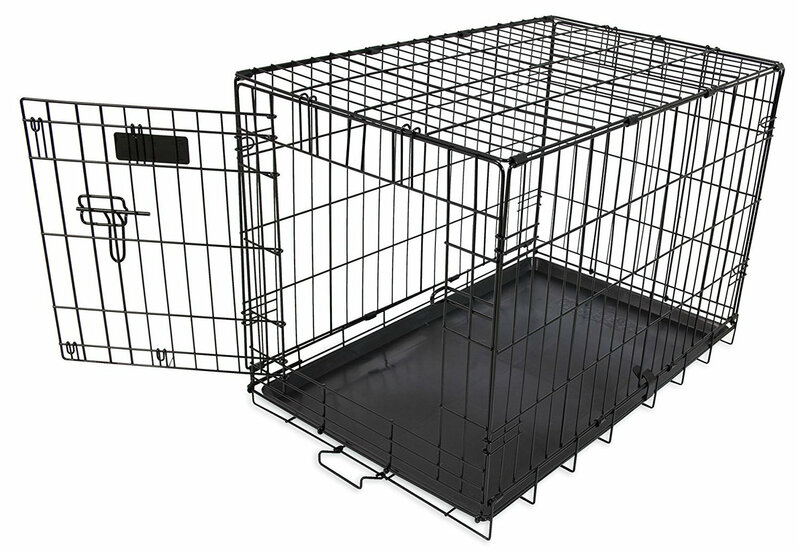 For your peace of mind, there’s a heavy-duty lock system on this cage that ensures that your dog is always safe when he’s in his crate. Also, for safety sake, you’ll find that all the corners on this crate are rounded to prevent sharp corners that could hurt you, your kids or your pet. To facilitate an even easier transport, the unit comes with a carrying handle, as well as rubber feet for the sake of your floors. 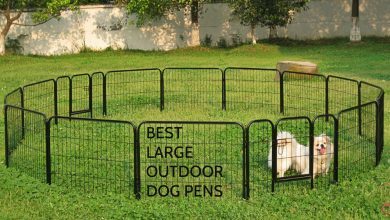 If a 30inch dog crate or larger is what you need though, this model also comes in that size as well as several others. Since 1985, Precision Pet Products has been manufacturing and supplying quality pet products that have earned it a leading position in the pet industry. The assurance from this brand is that when you make your purchase, you’re getting products made from only the strongest raw materials to ensure durability and functionality. Now, no matter how active your pups are, you can be sure that with Precision Pet products, you now have pet accessories that can match your pet strength for strength. Your pets will love this brand! 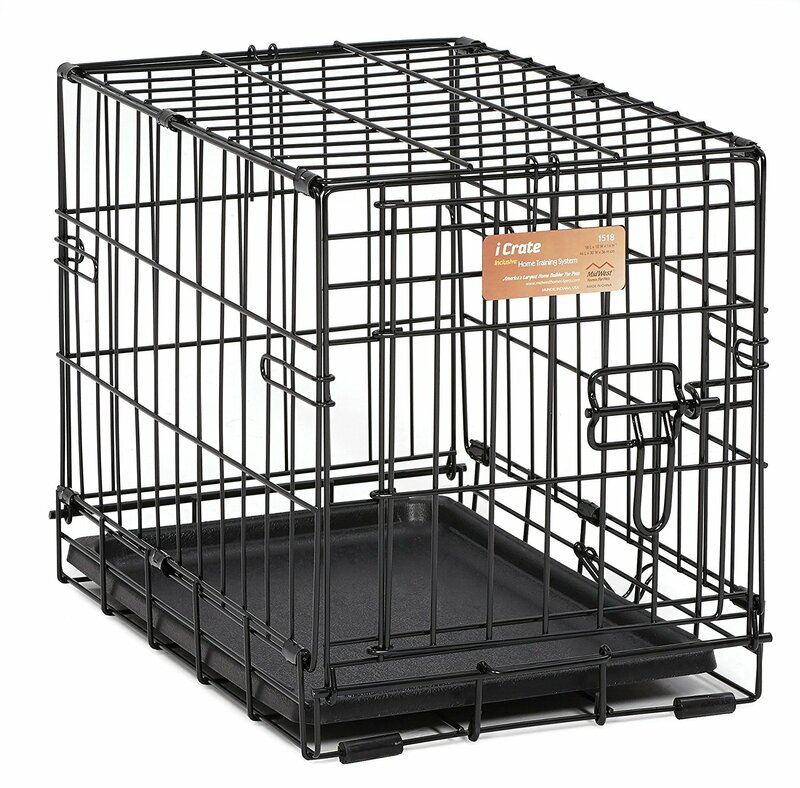 With dimensions reading: 19 x 12 x 15 inches, it’s obvious that the Precision Pet Two-Door Great Crate is far from a medium dog crate, they aren’t even small per se, they are more like extra small. So as the size suggests, you will be using this crate for your small breed or your puppy. At most, the pooch must be 10 pounds in size. It’s a fantastic crate to go for if you’re looking to crate-train your puppy. It even comes with a crate-training guide to help you! You know how puppies can be; very active and full of rambunctious energy. So it’s important that any dog crate you get is strong enough to withstand all that energy. 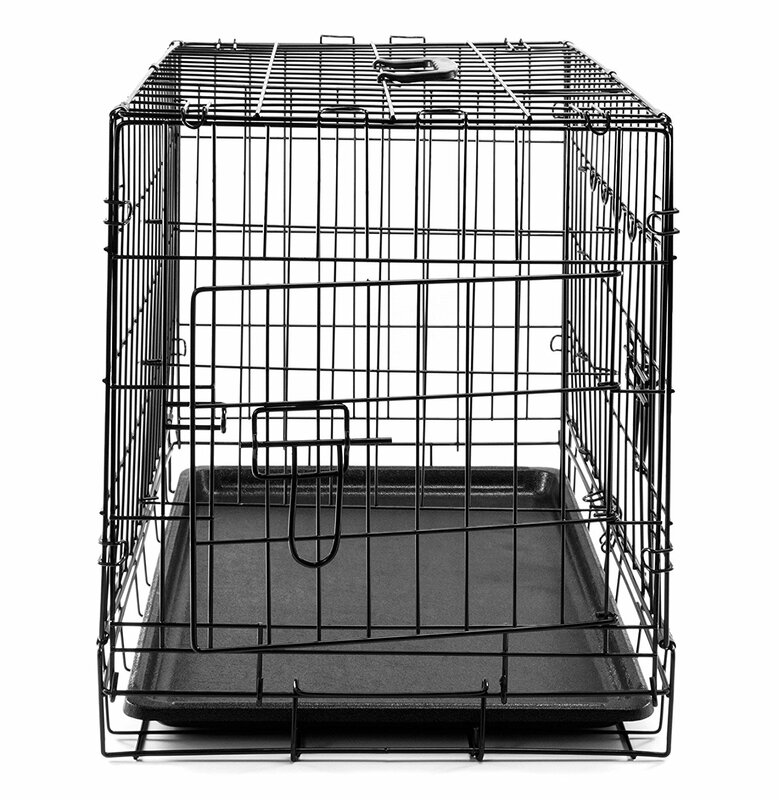 The Precision Pet Two-Door Great Crate is made of heavy-duty wire to withstand all the abuse and stay strong for years. To top it off, the crate is painted with a black e-coat finish to keep the crate from rusting. With its extra small size, you might not really need a divider panel, but then again there is a medium dog crate option with this particular model as well as large crates, so if you need any of those other ones instead, you’d also get a divider panel with them as well. It is pretty easy to assemble and collapse this unit, so you wouldn’t have any problems either with storing it or transporting it. So you can be completely rest assured concerning your pet’s safety, the lock system is made to be super secure. Also, the corners are well-rounded in order not to cause any harm to anyone by contact with sharp corners. MidWest is a renowned brand that has made some of the finest pet care products in history for well over 90 years. Its 9-decade old success story is hinged on its commitment to quality and innovative designs. So you can trust that every product manufactured by MidWest goes through rigorous testing and quality assurance at every stage of the manufacturing process. The aim is to give your pets a safe, comfortable and beautifully-designed place to call home. And so we’ve been looking through MidWest’s products for a while and we have found a 24-inch dog crate, popularly referred to as iCrate that we think you’ll totally love. What makes this cage a must-have for you, as a pet owner, is that you won’t just be having a mere dog crate but a puppy training crate. With its divider panel, you can have your puppy in it without it feeling like a needle in a haystack. In fact, he’ll still be able to use the crate when he is bigger and much older. So his home grows bigger as he grows bigger because of the divider panel. The Home Training System ensures that the cage protects and secures the dog properly while it helps you deal with unnecessary wanderings and unpleasant behaviors that he may have. So you can now have a potty-trained, non-chewing, and less-barking dog to call yours. MidWest thinks the safety of your dog is too important to be trifled with and you remember we also mentioned how it pays attention to details, right? Well, to ensure that your pup stays safe and secure in the cage, this dog crate has been designed with round edges at every corner to reduce the risk of injuries to your canine. It also comes with a heavy-duty latch system that ensures the dog doesn’t get out of the cage at a time you don’t want it to. The point is that the safety of your dog is guaranteed when he is in this cage. Assembly is a breeze! You can have the cage up and ready for use in few minutes after you have received your order without any tool whatsoever. And when you need to pack and store it up for any reason it folds down quite easily and takes up only a tiny fraction of your storage space. It also comes with a set of plastic handles to make carrying and moving it very easy. Carlson’s first venture into the pet care industry was to solve a problem many pet owners had – the lack of real pet cages. It observed how people will only turn baby cages into pet cages to create a home for their pets, but also noticed how this solution wasn’t doing so much for them. 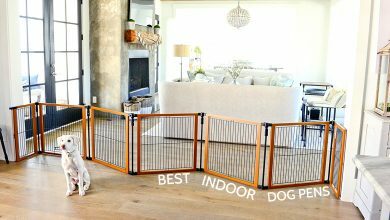 Since its first pet cage, Carlson’s Pet Products has remained dedicated to the well-being of pets by designing and manufacturing an extensive line of gates which have chew-proof durability, patented doors, all-steel construction, and non-toxic construction materials. 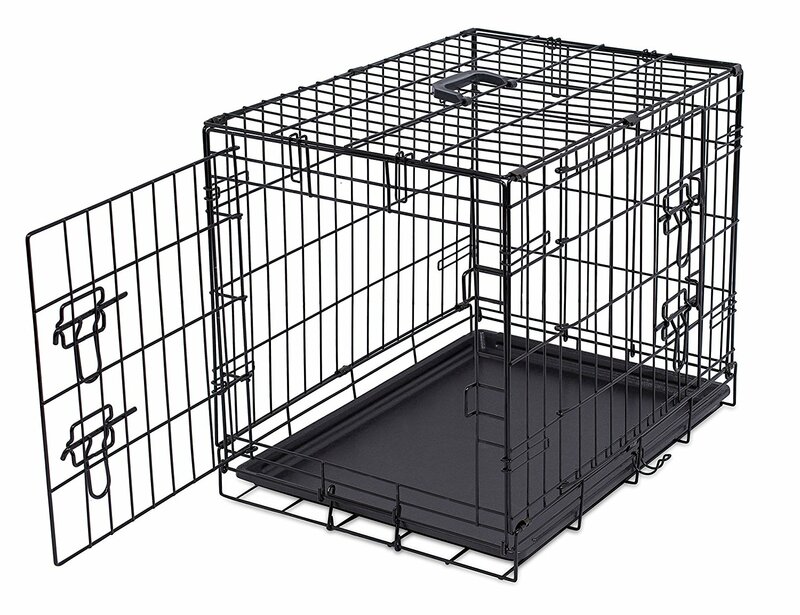 One of Carlson’s amazing innovations is its metal dog crate which is available in 5 different sizes in order to accommodate dogs and pups of all breeds, weights, and sizes. So if you want a small crate or an extra-large one or something in between, Carlson’s got you covered. This one we found is the medium-sized one and is suitable for breeds that weigh 45 pounds or less. For an estimate of how much space your furbaby will have if you go for this one, it is 30 inches long, 19 inches wide, and 21 inches high. Like every product manufactured by Carlson, this dog crate features an all-steel construction that assures durability and long-lasting use. The material is also chew-proof and will be suitable for dogs that think everything must be chewed on. Although this crate is likely to come assembled and ready for use, it folds easily into a compact size for easy car travel, storage, and portability. Inside this cage is a plastic pan that is easy to remove as it is easy to wash. It also comes in a black color so that while you are able to detect a mess on it, the cage doesn’t have to be a sore to the eyes. Security, right? Every pet owner should be concerned about that and we kept this in mind during our research. This cage comes with a secure lock system on its patented door that confines the dog and assures you of your dog’s safety. So, if you have that little Chihuahua that goes about chewing on things when you are out and away from home. You can have her in this cage with her food and water, knowing she’s safe and your things are safe too. Pet Mate was founded in 1986 and has since then been a leader in the world of ponds and pets. Its extensive line of products is categorized into 3 divisions: FISH MATE, CAT MATE, and DOG MATE. Pet Mate’s passion for problem-solving through innovative and functional pet products has helped it to widen its customer base as its products have gained prominence in over 40 countries in the world. It remains committed to providing quality products at pocket-friendly prices with an excellent customer service. Have you heard about its Aspen Single-Door Crate? This is certainly one puppy training crate you want to get for your fur buddy. The particular one we picked is 30 inches long and provides room for medium-sized dogs. However, it is also available in 5 other sizes so that you can select the one that is best suited for your pet. This dog crate has an easy but secure door mechanism that ensures your canine or feline is always safe when he or she is in it. This lock system further prevents gaps on top, at the sides, and in the middle of its door to increase the safety and strength of the whole door system. If you’ve been thinking about a dog crate that will be perfect for home training, then this is that crate you’ve been musing about. Because it comes already assembled, this crate will not require any setting up. All you need to do after delivery is to look for a perfect spot in your home and then lead the pet into it. However, when you need to transport or store it up, it folds easily into a compact size and takes up only a tiny portion of your space. For durability and long-lasting use, you can trust the electro-coat and rust-resistant finish of the cage as this increases its lifespan. Last but certainly not the least, it features a plastic, leak-proof pan that can be washed and maintained easily and a divider panel to adjust the size of the cage as the pet grows. This will work well for your cats or dogs both inside and outside your home. MidWest’s commitment to its philosophy about business (which is to provide its customers with quality and functional products at affordable prices) remains one of the major reasons why it has a 9-decade old success story to tell today. It boasts an astute research and development team that works hours unending to ensure that the final product meets all preset standards. So, when you own a product manufactured by MidWest, you can rest assured you own a durable and functional product. Its Life Stages Double Door Crate is a testimony to this fact. This small pet cage is designed to keep your pet in a secure and confined space with enough room to turn and stretch whenever it likes. However, you must ensure you check the size of your pet before you make a choice. And if this 18-inch crate is not suitable for your pet, that doesn’t mean you will miss out on this opportunity because the crate is available in 7 different sizes. 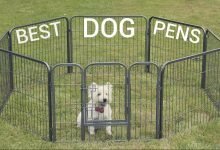 Security-wise, it features a secure door system known as MAXLock that ensures that your dog doesn’t bolt out of the cage by providing several lock points around the house. Two doors on this cage mean access is easy and with the way they are designed, you don’t need to bend or kneel to open the crate. The crate also features well-rounded corners to prevent injuries caused by jagged wires. Setting it up is also very easy and whenever you need to transport it you can take advantage of the fact that it folds down easily and in seconds. You also get to enjoy the benefits of a washable and removable plastic pan that is leak proof enough to hold your pet’s business. And when you need to move the pet around, you can use the detachable and comfort-grip plastic handles to get the job done. SmithBuilt was founded in 2007 and is a renowned brand that is dedicated to ensuring that pets have quality and safe crates to call their home. As much as quality matters to SmithBuilt, it ensures that its customers get its products at pocket-friendly prices. According to SmithBuilt, it is always there to help the budget-conscious pet owner get the best products for his pets. With this brand, you don’t have to compromise affordability for quality. So, we recommend its portable dog crate to you if you need a home for your dog(s). Unlike some cheap, flimsy and fancy pink dog crate that litter some stores, this particular cage delivers on the job any day. It is available in different sizes and comes with a divider that increases the pet’s space as the pet grows. It comes ready to be used, requires no assembly at all, and folds into a compact 4-inch thick size that makes it great to be carried around when you are traveling or when you want to store it up. And for extra ease in carrying this crate, it features durable and removable handles that can be fixed to any side of the crate you like. You can trust this product is built to last because it is made from high-grade materials. Its all-steel and high-tensile construction, in particular, promises durability and long-lasting use. Aside from this, the crate has an epoxy-coat finish that extends the lifespan of the crate. Meaning you can have a rust and corrosion-free experience training and protecting your pet even when the climates are in the extreme. It is a perfect choice if you are looking for something to transport and train your well-behaved dogs in. It also comes with 2 large doors – one at the side and one in front – that will open and close securely with two heavy-duty latches so that your fur babies can have a secure and safe environment to be in. To a major concern: how to deal with the pet’s poo or pee. Relax! This cage comes with a removable and leak-proof composite pan that is made from durable ABS construction and is designed to hold the mess in place with a retaining bar. This pan is odor-resistant and will not warp, corrode, or retain odors. 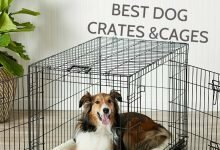 Sure, this isn’t all you need to know about small and medium dog crates, but what our guide and reviews have done is to give you the most important tips and bits of information you need to snag the very best crate for you and your dog. We hope you noted a few things, though. Now go on and get that dog crate for your pup.